With the inner workings of a D-SLT crammed into a tiny frame, is the Sony NEX-7 flagship CSC a real alternative for enthusiast photographers? We’ve seen a growing number of camera manufacturers entering the compact system camera (CSC) market and as a result, companies like Sony are now looking at new ways of further expanding this increasingly popular camera format. When CSCs first hit the scene in 2008, their place within the camera pecking order was clearly set – bridging the gap between compacts and D-SLRs. Now, with some manufacturers on their 2nd or 3rd generation of CSC, we’re starting to see some clear distinctions between specs, and the birth of entry-level, mid-range and enthusiast CSCs. 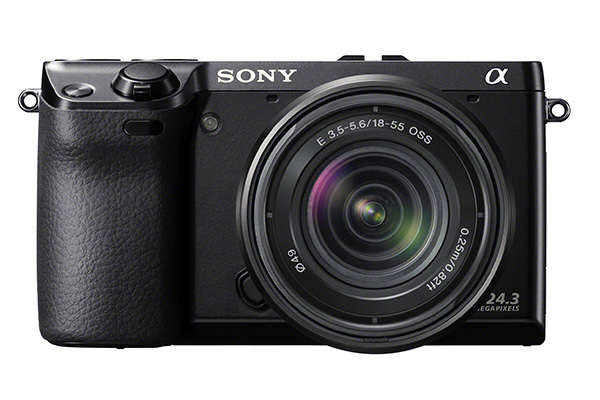 The Sony NEX-7 is Sony’s first attempt at the latter category, packing hi-spec technology taken from its enthusiast D-SLTs (Digital Single Lens Translucent) into the smaller CSC framework. As a result, Sony has created a lightweight camera that on paper has the potential to produce outstanding image quality that could rival that of an enthusiast D-SLR. Prying the NEX-7 from its slick, felt-lined box, the matte black unit oozes class in the build quality stakes. There’s a chunky rubberised grip that provides plenty of purchase, teamed with an ergonomic thumbrest on the back, allowing it to sit securely in the hand. Inside the magnesium-alloy body lurks a newly developed 24.3Mp CMOS sensor that’s capable of churning out huge 6000x4000px images at the native aspect ratio of 3:2, with the option of 16:9 also available. Working alongside Sony’s latest generation of BIONZ image processor, this new sensor isn’t just restricted to capturing stills; it also has the ability to record full 1080p HD video with a single press of the dedicated video record button. ISO range is equally impressive, spanning from 100 all the way to a 16,000 equivalent, although this is capped at 1600 when set to Auto mode. It’s worth noting also that the APS-C sized chip gives the NEX-7 a crop factor of 1.5x, which effectively turns the included 18-55m kit lens into a 27-82.5mm in 35mm film terms. Dominating the rear of the camera is a large 3in, 921k dot, tilt-angle LCD screen that can angle away from the body to aid with high and low angle shooting. Above that sits a built-in OLED, 2.3million dot Electronic View Finder (EVF), which automatically switches view from the monitor into the eyepiece when held to your face. Featuring an EVF gives the option of changing between a variety of on-screen guides to aid with composition – including grid lines, various shooting parameters and a level gauge – as well as providing near 100% frame coverage. Rather than a physical mode dial, shooting modes can be changed on-screen by hitting the centre scroll wheel button and rotating the dial. Within this list the standard M, A, S, P options are all available, as well as Intelligent Auto, Sweep Panorama, 3D Sweep Panorama, Anti Motion Blur and Scene Mode, which give access to a variety of creative shooting options. It’s clear that customisability was high on the agenda when Sony developed the NEX-7, as there are a large number of buttons that have been left completely unlabelled. This has been done to allow the user to personally assign specific functions to each of these buttons via the settings menu, to better suit their personal preference. Although at first using a mass of unlabelled controls took a bit of getting used to, it soon became second nature. The NEX-7’s speedy processor and impressive 0.02sec shutter lag meant our shots were ready for review in an instant. And, when switched over to 10fps continuous shooting, we found that the processor was capable of keeping up with the blistering pace, only starting to slow after 17 shots when shooting with Fine JPEG, or 14 shots with RAW. The crystal clear OLED EVF was superb and gave the advantage of being able to review images directly through the eyepiece after each snap, so we were always ready to bag the next shot. The 3in LCD screen was equally as sharp, retaining superb clarity and colour. One feature we found incredibly useful was the ability to set the EVF and monitor to two different displays. This meant we were able to view shooting information on the main LCD monitor, while keeping the EVF set to LiveView mode for shooting – similar to a D-SLR setup. This nicely complemented the custom button functions, which we’d mapped out in a similar layout to our everyday D-SLR – smoothing the transition from one to the other. The AF system performed quickly and accurately, locking onto targets with ease with no signs of hunting, even in dimmed lighting. One gripe is that when set to Continuous AF the lens consistently whirred back and forth while half-depressing the shutter. And when composing through the EVF, the effect is quite dizzying – though this is lessened somewhat when using the main LCD screen. On-screen settings were hesitant to respond at times and a persistent 1sec delay when switching between the EVF and monitor became rather frustrating. Given the option, we’d have much preferred a physical mode dial, too, but on the whole, these were all minor issues within an otherwise well-oiled operation. Although the NEX-7 certainly impressed us with a great all-round performance, at £1125 (with 18-55mm) it’s over double the cost of the Silver Award- winning Sony NEX-5N (£529 with 18-55mm) and £526 more than the Gold Award-winning Panasonic Lumix GX1 (£599 with 14-42mm). That said, it’s hard to compare the NEX-7 with any other CSC currently available, as it stands alone in the market, with its competitors unable to fend off such a high-end spec sheet. If you’re in the market for a small, attractive and powerful interchangeable lens camera, the NEX-7 ticks all the boxes. With its impressive 10fps shooting, high quality 24.3Mp images and a superb built-in OLED EVF, it’s certainly one to consider – despite the steep price tag.